Our aim is to ‘grow retail SRI’ by bringing together information that showcases the many different ways in which individual investors’ diverse needs can be met through ethical, sustainable and responsible investment (SRI) options. We believe current SRI fund inflows are a long way from reflecting the real level of individual investor interest – and that the potential for growth in this important market is very significant. Fund EcoMarket is all about facilitating this transition by offering advisers and others help identifying investors ethical, social and environmental aims and finding ‘ethically appropriate’ investment options – with lots of supporting information. To ensure this tool is useful to independent advisers we list all relevant regulated, retail, onshore funds (plus some extras) . We are however entirely reliant on support from fund mangers who share our aims. Please contact us if you would like to become a sponsor or are interested in adding information to Fund EcoMarket. There are two different forms that relate to entries on our website; for ‘individual fund entries’ and ‘corporate level entries’. These can be downloaded via our Fund EcoMarket site here. 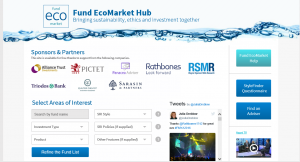 Fund EcoMarket is a ‘whole of retail SRI market’ directory, information hub and tool. By this we mean – all regulated, onshore, retail SRI and ethical funds are listed – plus a number of other related fund entries and ‘Responsible Ownership’ and ‘ESG Integration’ entries (ie Corporate Level) and SICAV options. We plan to increase the number of entries over time – expanding into areas such as DFMs and offshore funds. Fund EcoMarket (the fund database hub) and SRI StyleFinder (the online SRI Fact Find tool) helps make it easier for people (particularly advisers) to identify key ‘ethical aims’ and find options that suit those aims. The fact find ‘output’ can be used in the ‘SRI Styles’ filter option on the database to find ‘ethically relevant’ options more quickly. The search can also be refined with the use of additional filters. Both areas of the site help meet adviser ‘audit trail’ requirements – as they offer full reporting functions. Please note, the information we offer is intended to compliment advisers existing processes (and tools) by presenting information that is rarely available elsewhere. Information on our sites also sets out how this area can be built into the advice process. The information we show is however for information only. It does not constitute advice and we are not authorised or regulated. 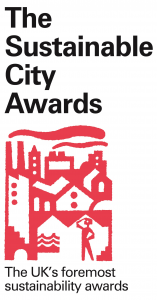 We were awarded ‘Highly Commended’ in the Corporation of London’s prestigious Sustainable City Awards in 2015 (‘Sustainable Finance’ category) and shortlisted in 2016 – as well being a finalist in two 2016 Investment Week awards. Please contact Julia@sriServices.co.uk if you would like to work with us to help grow retail SRI.